It is unclear that how subcellular organelles respond to external mechanical stimuli. Here, we investigated the molecular mechanisms by which mechanical force regulates Ca2+ signaling at endoplasmic reticulum (ER) in human mesenchymal stem cells. Without extracellular Ca2+, ER Ca2+ release is the source of intracellular Ca2+ oscillations induced by laser-tweezer-traction at the plasma membrane, providing a model to study how mechanical stimuli can be transmitted deep inside the cell body. 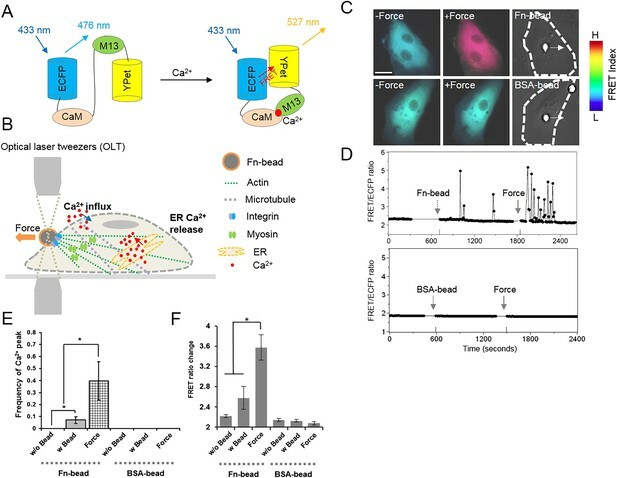 This ER Ca2+ release upon mechanical stimulation is mediated not only by the mechanical support of cytoskeleton and actomyosin contractility, but also by mechanosensitive Ca2+ permeable channels on the plasma membrane, specifically TRPM7. However, Ca2+ influx at the plasma membrane via mechanosensitive Ca2+ permeable channels is only mediated by the passive cytoskeletal structure but not active actomyosin contractility. Thus, active actomyosin contractility is essential for the response of ER to the external mechanical stimuli, distinct from the mechanical regulation at the plasma membrane. Cells receive many signals from their environment, for example, when they are compressed or pulled about by neighboring cells. Information about these ‘mechanical stimuli’ can be transmitted within the cell to trigger changes in gene expression and cell behavior. When a cell receives a mechanical stimulus, it can activate the release of calcium ions from storage compartments within the cell, including from a compartment called the endoplasmic reticulum. Calcium ions can also enter the cell from outside via channels located in the membrane that surrounds the cell (the plasma membrane). Kim et al. investigated how mechanical forces are transmitted in a type of human cell called mesenchymal stem cells using optical tweezers to apply a gentle force to the outside of a cell. These tweezers use a laser to attract tiny objects, in this case a bead attached to proteins in the cell's outer membrane. 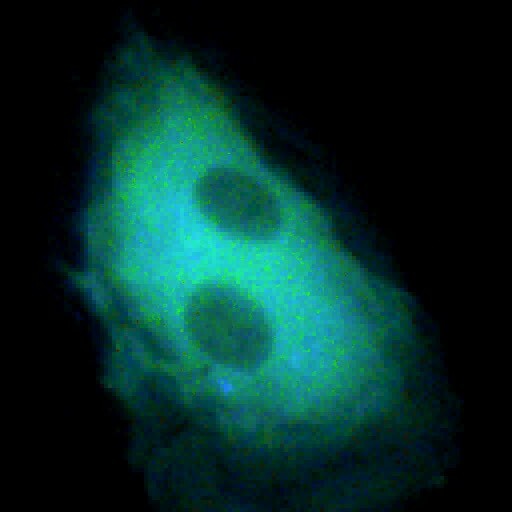 The cell's response to this mechanical stimulation was measured using a sensor protein that fluoresces a different color when it binds to calcium ions. With this set-up, Kim et al. found that mesenchymal stem cells are able to transmit mechanical forces to different depths within the cell. The forces can travel deep to trigger the release of calcium ions from the endoplasmic reticulum. This process involves a network of protein fibers that criss-cross to support the structure of a cell—called the cytoskeleton—and also requires proteins that are associated with the cytoskeleton to contract. However, calcium ion entry through the plasma membrane due to a mechanical force does not require these contractile proteins—only the cytoskeleton is involved. These results demonstrate that the transmission of mechanical signals to different depths within mesenchymal stem cells involves different components. Future work should shed light on how these mechanical signals control gene expression and the development of mesenchymal stem cells. Mechanical factors are known to play crucial roles in both development and tissue regeneration from stem cells. However, it remains unclear how these factors, such as mechanical forces, are converted into biochemical signals in stem cells to regulate regeneration processes. Calcium ion (Ca2+) as one of the most important biochemical signals, is involved in many cellular processes, including muscle contraction, differentiation, proliferation, gene expression, and apoptosis (Berridge et al., 2000; West et al., 2001; McKinsey et al., 2002; Landsberg and Yuan, 2004; Clapham, 2007; Maeda et al., 2007; Rong and Distelhorst, 2008). Various mechanical stimulations can affect cytosolic Ca2+ signals as well as Ca2+ dynamics in organelles or subcellular compartments, such as mitochondria and focal adhesion sites (Balasubramanian et al., 2007; Belmonte and Morad, 2008; Hayakawa et al., 2008; Horner and Wolfner, 2008). To apply mechanical force precisely, we utilize optical laser tweezers to generate force in a bead coupled to the cell surface through the ligation of adhesion receptors and transmit it into the cell at subcellular locations to trigger signal transduction (Berns, 2007; Botvinick and Wang, 2007). Most cells mobilize their Ca2+ signals via the Ca2+ entry across the plasma membrane and/or the Ca2+ release from intracellular stores such as endoplasmic reticulum (ER) or sarcoplasmic reticulum (SR) (Wehrens et al., 2005; Clapham, 2007). Biochemical signals, such as inositol 1,4,5-trisphosphate (IP3), are known to regulate Ca2+ release from ER. But direct regulation of ER Ca2+ signals by mechanical force is unknown. The human mesenchymal stem cells (HMSCs) displaying Ca2+ oscillations provide a model system to study that (Kawano et al., 2002; Sun et al., 2007). As Ca2+ influx at the plasma membrane and release from ER are the only two sources for Ca2+ oscillations in HMSCs (Kawano et al., 2002; Kim et al., 2009), we dissected the effect of mechanical force on each process by monitoring the calcium signals at subcellular locations. To visualize Ca2+ signal with high spatiotemporal resolutions, we employed a fluorescence resonance energy transfer (FRET)-based Ca2+ biosensor and its variants anchored at subcellular organelles (Miyawaki et al., 1997; Ouyang et al., 2008). Here, we combined optical laser tweezers to deliver local mechanical force and FRET biosensors to investigate how mechanical force regulates Ca2+ signals at different subcellular locations in HMSCs. We first investigated how force regulates Ca2+ release from ER with the FRET-based Ca2+ biosensor (Figure 1A) to dissect the effect of mechanical force on each of the two Ca2+ mobilization processes (Figure 1B). The experiments were done in the absence of extracellular Ca2+ so that there was no Ca2+ influx through plasma membrane and the oscillations were mainly from ER release (Figure 1B). When fibronectin (Fn)-coated beads were seeded onto the HMSCs and 300 pN of mechanical force was applied by optical laser tweezers as described previously (Wang et al., 2005), Ca2+ oscillations were induced in HMSCs (Figure 1C-F, Video 1) but not in bovine aortic endothelial cells (BAECs) (Figure 1—figure supplement 1). In contrast, laser-tweezer-traction on bovine serum albumin (BSA)-coated beads did not cause any oscillations (Figure 1C–F). These results indicate that without extracellular Ca2+, mechanical force can induce Ca2+ oscillations by triggering Ca2+ release from ER. Further experiments showed that depletion of ER Ca2+ by Thapsigargin (TG) or inhibition of Ca2+ release from the ER by 2-Amino-ethoxydiphenylborate (2-APB) entirely abolished the force-induced oscillations (Figure 1—figure supplement 2A,B). These results confirmed that the ER Ca2+ store is the main source for the force-induced oscillations in HMSCs without extracellular Ca2+. Intracellular Ca2+ oscillations in response to mechanical force in HMSCs with Ca2+-free medium. (A) A schematic drawing of the activation mechanism of the Ca2+ FRET biosensor. (B) Beads coated with Fn or BSA were seeded onto the cell and mechanical force was applied by pulling a Fn-coated bead using optical laser tweezers. Both Ca2+ influx and ER Ca2+ release can contribute to force-induced Ca2+ signals. (C) Color images represent the YPet/ECFP emission ratio of the cytoplasmic Ca2+ biosensor. The color scale bars represent the range of emission ratio, with cold and hot colors indicating low and high levels of Ca2+ concentration, respectively. (D) The time courses represent the YPet/ECFP emission ratio averaged over the cell body outside of nucleus upon seeding of Fn or BSA-coated beads and force application. (E–F) Bar graphs represent the frequency or ratio of the intracellular Ca2+ oscillations evoked by mechanical force. Error bars indicate standard error of mean; *p < 0.05, n = 14. (Scale bar: 10 µm). A HMSC transfected with cytosolic Ca2+ biosensors before and after mechanical force application by optical laser tweezers on a Fn-coated bead attached to the cell (Duration of Video: 2700 s). Two possible mechanisms can regulate Ca2+ release from ER upon mechanical laser-tweezer-traction. External force can either 1) transmit deep inside the cell and mechanically alter the channels on ER for Ca2+ release (Himmel et al., 1993; Missiaen et al., 1996; Rath et al., 2010); or 2) trigger biochemical signaling cascades to produce IP3 that diffuses inside to activate IP3-sensitive Ca2+ channels (Lehtonen and Kinnunen, 1995; Matsumoto et al., 1995). To distinguish them, we directly monitored the IP3 level using a FRET-based biosensor, LIBRAvIIs. Mechanical force did not induce any change of IP3 while ATP increased IP3 production in HMSCs (Figure 1—figure supplement 2C), suggesting that the second mechanism is unlikely. Therefore, laser-tweezer-traction should transmit deep inside the cells to mechanically release Ca2+ from ER. Cytoskeleton is known to transmit mechanical forces and conduct mechanotransduction (Hamill and Martinac, 2001; Orr et al., 2006; Schwartz and DeSimone, 2008), so we investigated the role of cytoskeleton and its associated proteins in the force-induced ER Ca2+ release. The disruption of cytoskeletal actin filaments by cytochalasin D (Cyto D) or microtubules by nocodazole (Noc) completely eliminated the force-induced Ca2+ oscillations (Figure 2A–B). In addition, the inhibition of actomyosin contractility by ML-7 or blebbistatin had the same effect (Figure 2C–D). Thus, the deep penetration and transmission of force inside the cell and the induction of Ca2+ release from ER depend on both cytoskeletal support and actomyosin contractility. This matches with the previous reports that long-distance force propagation to the deep cytoplasm depends on cytoskeleton tension (Hu et al., 2003) as well as the pivotal role of myosin light chain kinase (MLCK) and myosin II in regulating force development (Olsson et al., 2004; Herring et al., 2006; Fajmut and Brumen, 2008; He et al., 2008). There are two possible signals in ER that may trigger the Ca2+ release in response to mechanical force. 1) IP3R channels on the ER membrane are mechanosensitive and can be directly opened by transmitted mechanical force. Several lines of evidence supported this hypothesis. First, IP3R is coupled to cytoskeleton and associated proteins allowing mechanical coupling. A direct binding between IP3R and myosin II was discovered in C. elegans (Walker et al., 2002). In addition, IP3R has linkage to actin mediated by an adaptor 4.1N protein (Fukatsu et al., 2004; Turvey et al., 2005). IP3R also binds to ankyrins, which are adaptor proteins coupled to the spectrin-based cytoskeleton (Bourguignon et al., 1993; Joseph and Samanta, 1993). Second, IP3R channel has an α-helix bundle at the pore forming region, similar to voltage-gated potassium and calcium channels (Schug et al., 2008), which are generally found to be mechanosensitive (Morris, 2011). The mechanism for their mechanosensitivity is possibly that the α-helix tilt angle tends to change when the membrane thins upon mechanical tension, in order to do proper hydrophobic matching with the interfacial region of the membrane, which leads to channel opening (Cheng et al., 2004; Kim and Im, 2010). Therefore, it is likely that the IP3R channel is also mechanosensitive. 2) Other mechanosensitive channels on ER, for example, transient receptor potential (TRP) family, may also contribute to this force-induced Ca2+ release. A number of TRP channels have been found to express at ER membranes, such as TRPC1 (Berbey et al., 2009), TRPV1 (Gallego-Sandin et al., 2009), TRPM8 (Bidaux et al., 2007), and TRPP2 (Koulen et al., 2002). As some TRP channels have been shown to be mechanosensitive and have linkage to cytoskeleton (Barritt and Rychkov, 2005), it is likely that TRP channels located at ER may mediate, at least in part, the force-induced ER calcium release. Notably, these two possibilities are not mutually exclusive as more than one type of channels can be responsible for the force-induced ER calcium release. Cytoskeletal support, actomyosin contractility, and TRPM7 channels mediate the force-induced intracellular Ca2+ oscillations. The time courses represent the YPet/ECFP emission ratio of cytoplasmic Ca2+ in HMSCs in the absence of extracellular Ca2+ when these cells were pretreated with (A) 2 μM Cyto D (n = 8), (B) 1 μM Noc (n = 8), (C) 5 μM ML-7 (n = 8), and (D) 5 μM Bleb (n = 8). 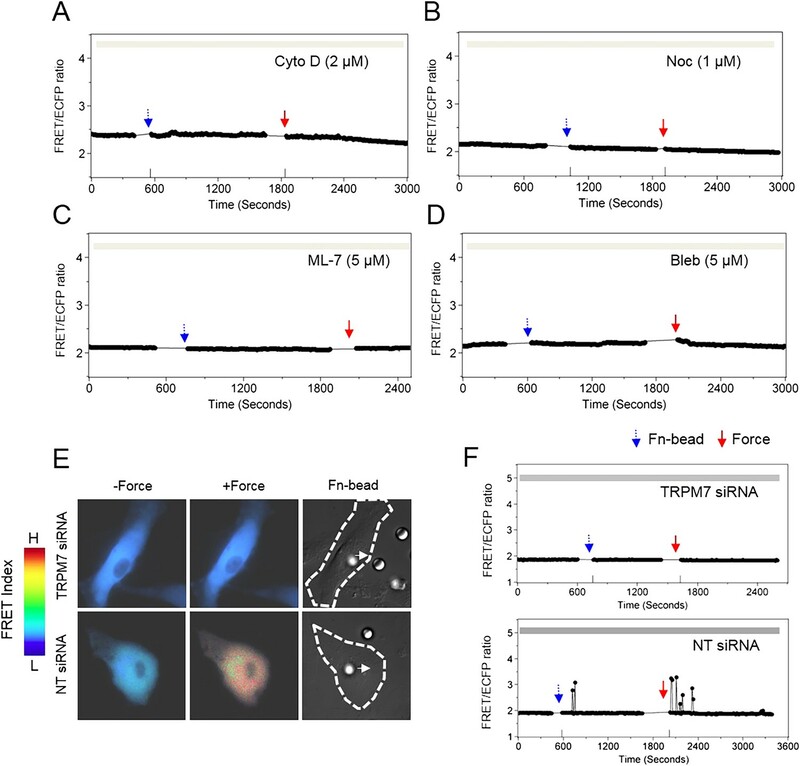 (E) Color images represent the YPet/ECFP emission ratio of the cytoplasmic Ca2+ biosensor in HMSCs transfected with NT or TRPM7 siRNA. The color scale bars represent the range of emission ratio, with cold and hot colors indicating low and high levels of Ca2+ concentration, respectively. (F) The time courses represent the YPet/ECFP emission ratio averaged over the cell bodies outside of nucleus treated with siRNA as indicated. Surprisingly, blocking stretch-activated or store-operated channels at the plasma membrane by Gd3+, La3+, or streptomycin, but not L-type voltage-operated Ca2+ channels by Nifedipine, abolished the mechanical force-induced Ca2+ release from ER (Figure 2—figure supplement 1). These results suggest a possible coupling between force-induced Ca2+ release at ER and stretch-activated and store-operated channels at the plasma membrane. As TRPM7 is one of the major Ca2+ permeable mechanosensitive channels (Wei et al., 2009), we knocked down TRPM7 with targeting small interfering RNA (siRNA) to examine its role in the force-induced Ca2+ oscillations. The decreased expression of TRPM7 and the lower percentile of HMSCs with Ca2+ oscillations confirmed the effect of siRNA (Figure 2—figure supplement 2A,B) TRPM7 siRNA further abrogated the force-induced oscillations (Figure 2E–F). It is intriguing that the inhibition of TRPM7 at the plasma membrane can block the force transmission into ER in regulating calcium signals. Several possibilities may contribute to the observed results. 1) TRPM7 is functionally coupled to integrin, actomyocin contractility and cytoskeleton. As such, it may mediate and facilitate the force transmission to ER. Indeed, it has been shown that TRPM7 kinase can phosphorylate myosin II heavy chain (Clark et al., 2006) and regulate actomyocin contractility. 2) TRPM7 activity may have some downstream effect on IP3R in ER. For example, TRPM7 can control the protease calpain (Su et al., 2006), which can regulate IP3R degradation in ER (Diaz and Bourguignon, 2000). 3) TRPM7 may also be directly coupled to IP3R in the ER through adaptor proteins. Indeed, another TRP channel, TRPC1 has been shown to directly couple to IP3R in the ER through an adaptor protein Homer (Yuan et al., 2003). It becomes clear that membrane channels are not isolated entities floating in the plasma membrane. Instead, they are intimately coupled to integrins, cytoskeleton, actomyocin contractility, and ER membrane channels (Cantiello et al., 2007; Matthews et al., 2007; Deng et al., 2009). Therefore, these structural and physical couplings enable membrane channels to participate in direct force transmission to ER. We further visualized the Ca2+ release from ER directly, by generating and employing an improved ER-targeting Ca2+ biosensor (D3ER) (Palmer et al., 2006; Ouyang et al., 2008). Mechanical force could directly induce the Ca2+ release from ER without extracellular Ca2+, as evidenced by the decrease in ER Ca2+ concentration (Figure 3A-B, Video 2). 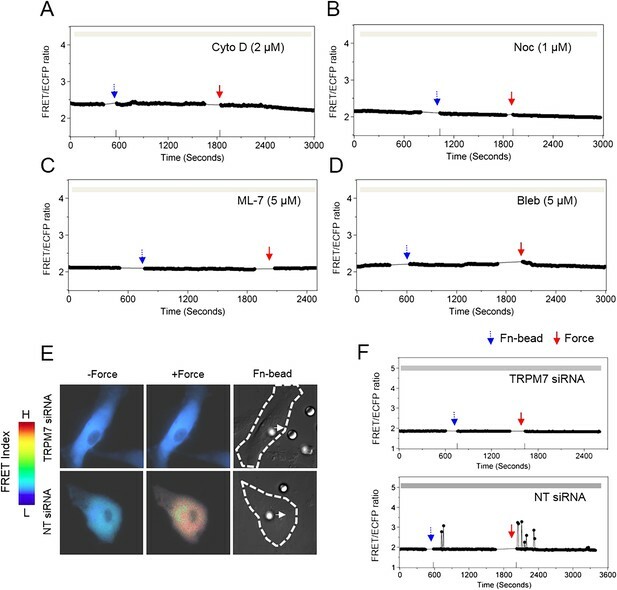 The measurements of direct Ca2+ release from ER in the presence of inhibitors or siRNA of TRMP7 were also consistent with our observations when cytosolic Ca2+ biosensor was used (Figure 3C). The visualization of force-induced Ca2+ release from ER using a FRET-based ER Ca2+ biosensor. (A) The time course and (B) the color images of YPet/ECFP emission ratio in HMSCs expressing the D3ER biosensor before and after force application. The red arrows indicated episodes of Ca2+ release from ER. (C) The bar graphs represent the normalized changes of YPet/ECFP emission ratio of the D3ER in HMSCs upon force application without extracellular Ca2+ in the untreated cells as the control group (n = 3) or cells pretreated with CytoD (n = 5), Noc (n = 5), ML-7 (n = 6), Bleb (n = 5), or TRPM7 siRNA (n = 9) as indicated. * represents p < 0.05. A HMSC transfected with ER Ca2+ biosensors before and after mechanical force stimulation by optical laser tweezers on a Fn-coated bead attached to the cell (Duration of Video: 450 s). To gain more insights, we then examined the effect of force on Ca2+ influx at the plasma membrane. ER Ca2+ release was blocked by an IP3Rs inhibitor, 2-APB, in the presence of extracellular Ca2+ so that the only source of intracellular Ca2+ change is the calcium influx from extracellular space (Bootman et al., 2002). Nifedipine did not have any effect on the force-induced Ca2+ influx, while Gd3+, La3+, streptomycin, and TRPM7 siRNA significantly inhibited this Ca2+ influx (Figure 4A–B), confirming the involvement of mechanosensitive channels, especially TRPM7, which was shown to be directly activated by a membrane stretch or shear stress in various cell types (Numata et al., 2007a, 2007b; Wei et al., 2009). The disruption of actin filaments or microtubules also inhibited the force-induced Ca2+ influx (Figure 4C–D), suggesting that cytoskeletal integrity is essential for the membrane channels to respond to force, consistent with previous reports (Hayakawa et al., 2008). 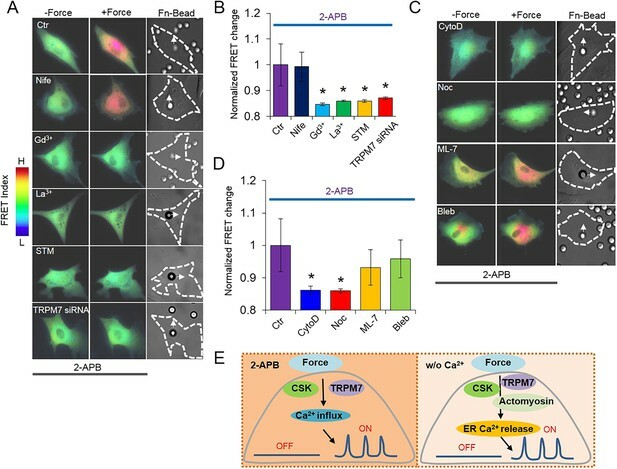 Interestingly, ML-7 or blebbistatin did not affect this force-induced Ca2+ influx, suggesting that active actomyosin contractility may not be involved in the mechano-regulation of membrane channels (Figure 4C–D), different from their indispensable roles in the force-induced ER Ca2+ release (Figure 4E). Ca2+ influx in response to mechanical force in Ca2+-containing medium. Ca2+ release from ER in all the HMSCs was blocked by pretreatment with 2-APB. (A, C) Color images represent the YPet/ECFP emission ratio of the cytoplasmic Ca2+ biosensor in control cells treated by 2-APB only (n = 5) or those co-treated by Nifedipine (n = 5), Gd3+ (n = 3), La3+ (n = 6), STM (n = 8), or TRPM7 siRNA (n = 9), CytoD (n = 8), Noc (n = 4), ML-7 (n = 9) or blebbistatin (n = 6). Arrows in DIC images point to the direction of applied force. (B, D) Bar graphs represent the normalized change of YPet/ECFP emission ratio of the cytoplasmic Ca2+ biosensor under different conditions as indicated in (A, C). Error bars indicate standard errors of mean; * represents p < 0.05. (E) The models depicting the mediators of mechanical force-induced Ca2+ influx or ER Ca2+ release. Since mechanical stimulation such as stretch affects integrin adhesion and integrin-associated signaling, including Src and focal adhesion kinase (FAK) (Wang et al., 2005; Orr et al., 2006), we investigated whether Src and FAK mediate the force-induced Ca2+ signals. Our results indicated that neither PP1, an inhibitor of Src family kinases, nor PF228, an inhibitor of FAK, had a significant effect on the force-induced Ca2+ influx or ER release (Figure 4—figure supplement 1). Inhibition of phosphoinositide 3-kinases (PI3Ks) with LY294002 did not have any effect either (Figure 4—figure supplement 1). Although integrin-mediated Src phosphorylation and activation can regulate L-type Ca2+ channel functions (Gui et al., 2010), the force-induced Ca2+ oscillations were clearly independent of L-type Ca2+ channels in HMSCs (Figure 2—figure supplement 1). Mechanical stretch can induce the phosphorylation of FAK and nitric oxide formation in cardiomyocytes (Pinsky et al., 1997; Khan et al., 2003), which can modulate ryanodine receptor 2 (RYR2) and Ca2+ release at the SR (Vila Petroff and Mattiazzi, 2001). However, there is minimal expression of RYRs in HMSCs (Kawano et al., 2002), which may explain the lack of FAK involvement in the mechano-regulation of Ca2+ signals. Together, the biochemical activities above have no detected involvement in the force-induced Ca2+ signals. 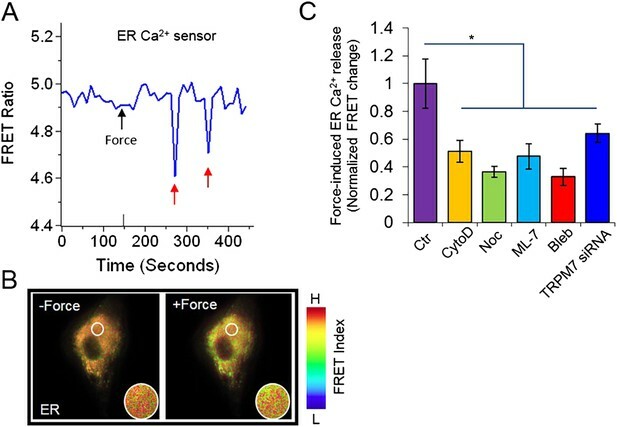 Further analysis of the duration between force application and the first Ca2+ signal indicated that in the absence of extracellular Ca2+, the average delay time of ER calcium release monitored by both cytosolic Ca2+ biosensor and ER Ca2+ biosensor are around 100 s (Figure 4—figure Supplement 1C). Meanwhile, the average delay time of the calcium influx through plasma membrane in the presence of 2-APB and extracellular calcium is much shorter, around 20 s (Figure 4—figure supplement 1C), indicating faster response to mechanical force stimulation. Although the delay time of ER calcium release is longer than that of calcium influx across the plasma membrane, it does not contradict mechanical signal-mediated mechanism. Several reasons may contribute to longer time delay of ER calcium release. 1) The mechanical coupling machinery may need time for reinforcement to allow sufficient force transfer between the plasma membrane and the ER membrane. It is likely that mechanical force transmits through integrins and cytoskeleton (Wang et al., 1993; Perozo and Rees, 2003) as only Fn-coated, but not BSA-coated beads can induce ER calcium release (Figure 1C–F). However, the discrete network linkage of the existing cytoskeleton at the time of force application may not be sufficient for force focusing and transmission to ER, particularly because the apical integrins bound to the Fn-coated beads had not previously experienced force and therefore may have limited connection with cytoskeleton (Matthews et al., 2006). As force can unfold proteins, change their conformations to expose cryptic binding sites to allow the assembly of new/stronger network linkages (del Rio et al., 2009; Johnson et al., 2007), mechanical force can modulate the structural coupling of molecules and mechanical properties of the cells through cytoskeletal remodeling (Kaazempur Mofrad et al., 2005; Matthews et al., 2006; Rosenblatt et al., 2007). These modulation processes of mechanical coupling and reinforcement may need time to reach the threshold for sufficient mechanotransduction of ER calcium release; 2) the channels on ER membrane could have different kinetics and mechanosensitivity (Moe et al., 1998), therefore they may need larger focused and reinforced force to be developed at the site of ER to reach the threshold for physical opening. All these factors may contribute to the longer delay time for force-induced ER calcium release. Again our model does not rule out biochemical signal-mediated mechanisms. As a matter of fact, biochemical signal-mediated mechanisms, such as protein–protein interaction and cytoskeletal remodeling under mechanical tension are important to mediate mechanical signals as discussed above. As such, our results have provided molecular insights on how mechanical force triggers intracellular Ca2+ oscillations through two mechanisms in HMSCs: Ca2+ influx at the plasma membrane and Ca2+ release from ER (Figure 1B). Our results showed that the deep penetration and transmission of mechanical force to regulate ER functions is dependent on not only the passive cytoskeletal support of actin filaments and microtubules, but also the active actomyosin contractility controlled by MLCK and myosin II. In contrast, the passive cytoskeletal support, but not active actomyosin contractility, is needed for the mechanotransduction at the plasma membrane levels, including the mechanoactivation of channels and Ca2+ influx across the plasma membrane (Figure 4E). These results hence provide direct evidence that the mechanotransduction at different depths of cell body is mediated by differential sets of mechanosensing elements. The construct of FRET-based Ca2+ biosensor has been described well in our previous articles (Ouyang et al., 2008; Kim et al., 2009). In brief, the fragment containing enhanced cyan fluorescent protein (ECFP), calmodulins (CaMs), and M13 was fused to YPet and subcloned into pcDNA3.1 (Invitrogen, Carlsbad, CA) for mammalian cell expression by using BamHI and EcoRI sites. The ECFP/YPet pair has allowed a higher sensitivity of FRET biosensors than those based on ECFP/Citrine pair. To generate an improved ER-targeting Ca2+ biosensor, the mutant peptide and CaMs regions were replaced with those regions of D3cpv and cloned between a truncated ECFP and YPet. For the ER targeting motifs, the calreticulin signal sequence MLLPVLLLGLLGAAAD was added 5′ to ECFP, and an ER retention sequence KDEL to the 3′ end of YPet. The construct of a FRET-based IP3 biosensor, LIBRAvIIs was kindly provided by Professor Akihiko Tanimura at University of Hokkaido, Japan (Tanimura et al., 2009). Human mesenchymal stem cells (HMSCs) and bovine aortic endothelial cells (BAECs) were obtained from the American Type Culture Collection (ATCC, Rockville, MD). HMSCs and BAECs were cultured in human mesenchymal stem cell growth medium (MSCGM, PT-3001, Lonza Walkersville, Inc., Walkersville, MD) and in Dulbecco's modified Eagle's medium (DMEM), respectively, supplemented with 10% fetal bovine serum (FBS), 2 mM L-glutamine, 100 U/ml penicillin, and 100 µg/ml streptomycin. The cells were cultured in a humidified incubator of 95% O2 and 5% CO2 at 37°C. The DNA plasmids were transfected into the cells by using Lipofectamine 2000 (Invitrogen, Carlsbad, CA) according to the product instructions. Double-stranded small interfering RNA (siRNA) sequences targeting human TRPM7 (ON-TARGETplus SMARTpool siRNA) and non-targeting control sequences were designed by Dharmacon RNAi Technology (Dharmacon Inc., Lafayette, CO). HMSCs were transfected with 1–2 µg siRNA specific for TRPM7 or a non-silencing control sequence according to the product instructions. The cells transfected with TRPM7 or non-targeting siRNA were washed twice with cold phosphate buffered saline (PBS) and then lysed in lysis buffer containing 50 mM Tris, pH 7.4, 150 mM NaCl, 1 mM EDTA, 1% Triton X-100, and a mix of serine and cysteine protease inhibitors. Lysates were centrifuged at 10,000×g at 4°C for 10 min. Cell lysates were then applied to 15% SDS-polyacrylamide gel electrophoresis, transferred to nitrocellulose, blocked with 5% non-fat milk, and detected by Western blotting using polyclonal goat anti-TRPM7 antibody (1:100; Abcam Inc., Cambridge, MA). A polyclonal antibody against TRPM7 was used in both normal HMSCs and TRPM7-knockdown HMSCs. After being washed in cold phosphate buffered saline (PBS), the samples were fixed by 4% paraformaldehyde in PBS at room temperature for 15 min. The samples were incubated with a goat polyclonal antibody against TRPM7 (1:100; Abcam Inc., Cambridge, MA) at room temperature for 2 hr, followed by the incubation with TRITC-conjugated anti-goat IgG (1:100, Jackson ImmunoResearch Lab., Inc., West Grove, PA) at room temperature for 1 hr before the mounting of anti-photobleaching reagent (Vector Lab., Inc., Burlingame, CA). Imaging experiments were conducted with Ca2+ free Hanks balanced salt solution (HBSS, Invitrogen) containing 20 mM HEPES, 1 mM D-glucose, 0.5 mM EGTA, 1 mM MgCl2, and 1 mM MgSO4 (pH 7.4). During imaging experiments, the solution was kept in streptomycin free condition to prevent a possible effect on mechanosensitive ion channels. The chemical reagents 2-Amino-ethoxydiphenyl borate (2-APB), Nifedipine, Thapsigargin (TG), LaCl3, GdCl3, streptomycin, nocodazole, cytochalasin D, blebbistatin, and ML-7 were purchased from Sigma–Aldrich (Sigma, St. Louis, MO). PP1 and LY294002 were commercially obtained from Calbiochem (San Diego, CA). PF228 was obtained from Tocris Bioscience (Ellisville, MO). The amount of drug administration was based on previous publications (Kim et al., 2009; Lu et al., 2011; Seong et al., 2011). A fiber-coupled IR (infra-red) laser (1064 nm, 5W, 5 mm diameter, YLD-5-1064-LP, IPG Photonics) was used for the experiment. We used a piezoelectric system for a steering mirror and the piezo-mirror system was designed with a closed loop, and an automated shutter (LS6ZM2, Uniblitz, Rochester, NY) with a shutter controller (VCM-D1, Uniblitz). Mirrors (designed for IR), lenses (BK7, plano-convex), and other basic optics were purchased from Thorlabs (Newton, New Jersey). A hot mirror (FM01, wide band, Thorlabs) was installed inside a microscope to block the IR scattering. The piezo-mirror (S-334.2, (PI) Physik instrumente) was installed together with the computer interface module of (E-516.I3, PI). The interface module set up with the other drivers (E-503.00 and E-509.S3, PI) makes it possible to control the piezo-mirror system by a computer. The laser beam passes through a laser-beam expander, a steering mirror, and a dichroic long-pass beam splitter to enter the microscope side port. Beads coated with fibronectin (Fn; 50 µg/ml) or BSA as the control were prepared as previously reported (Wang et al., 2006). The size of the beads is 10 µm and the beads were incubated for 10–20 min to allow them to adhere to cell membrane surface. Single-beam gradient optical laser tweezers with controlled 300 pN of mechanical force were applied to pull the adhered beads. A similar optical trapping system has been described in our previous report (Botvinick and Wang, 2007). Cells expressing various exogenous proteins were starved with 0.5% FBS for 36–48 hr before imaging experiments. All images were obtained by using Zeiss Axiovert inverted microscope equipped with a charge-coupled device (CCD) camera (Cascade 512B, Photometrics) and a 420DF20 excitation filter, a 450DRLP dichroic mirror, and two emission filters controlled by a filter changer (480DF30 for ECFP and 535DF25 for YPet). 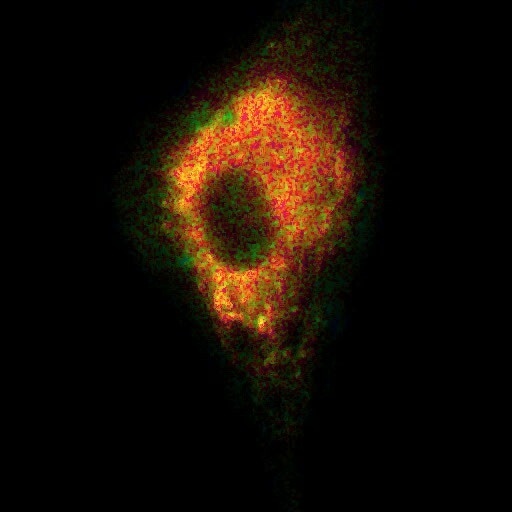 Time lapse fluorescence images were acquired at 10 s interval by MetaFluor 6.2 software (Universal Imaging, West Chester, PA). The emission ratio of YPet/ECFP was directly computed and generated by the MetaFluor software to represent the FRET efficiency before they were subjected to quantification and analysis by Excel (Microsoft, Redmond, WA). The results were expressed as the mean standard error of the mean (S.E.M). Statistical analysis of the data was performed by the unpaired Student's t-test to determine the statistical differences between the two mean values. The statistically significant level was determined by p < 0.05. American Journal of Physiology Regulatory, Integrative and Comparative Physiology 293:R1586–R1594. Annals of the New York Academy of Sciences 1123:58–63. Journal of Biological Chemistry 284:36387–36394. Methods in Cell Biology 82:457–466. Nature Reviews Molecular Cell Biology 1:11–21. The Journal of Clinical Investigation 117:1647–1657. Methods in Cell Biology 82:497–523. Journal of Biological Chemistry 268:7290–7297. Current Topics in Membranes 59:233–296. Journal of Chemical Information and Computer Sciences 44:1952–1960. The Journal of Biological Chemistry 284:22501–22505. Journal of Theoretical Biology 252:474–481. Journal of Biological Chemistry 279:48976–48982. Journal of Biological Chemistry 284:32591–32601. Advances in Experimental Medicine and Biology 674:69–79. Journal of Cell Science 121:496–503. American Journal of Physiology Cell Physiology 291:C817–C827. American Journal of Physiology Cell Physiology 285:C1082–C1090. Journal of Biological Chemistry 268:6477–6486. Journal of Cellular Physiology 218:285–293. News in Physiological Sciences 19:44–50. Advances in Experimental Medicine and Biology 592:37–46. The American Journal of Physiology 268:C458–C465. Journal of Cell Science 119:508–518. Mechanosensitive Ion Channels, Part A 58:59–85. Trends in Biochemical Sciences 27:40–47. The Journal of Biological Chemistry 271:4601–4604. Voltage-gated channel mechanosensitivity: fact or friction? Cellular Physiology and Biochemistry 19:1–8. American Journal of Physiology Cell Physiology 292:C460–C467. American Journal of Physiology Heart and Circulatory Physiology 287:H2712–H2718. Proceedings of the National Academy of Sciences of USA 105:14353–14358. Current Opinion in Structural Biology 13:432–442. Annual Review of Physiology 70:73–91. Annals of Biomedical Engineering 35:224–234. The Journal of Biological Chemistry 283:2939–2948. Current Opinion in Cell Biology 20:551–556. The Journal of Biological Chemistry 281:11260–11270. The Journal of Biological Chemistry 284:8910–8917. Journal of Cell Science 118:971–980. Heart, Lung & Circulation 10:90–98. Proceedings of the National Academy of Sciences of USA 103:1774–1779. Annual Review of Physiology 67:69–98. Proceedings of the National Academy of Sciences of USA 98:11024–11031. Thank you for sending your work entitled “Distinct mechanisms regulating mechanical force-induced Ca2+ signals at the plasma membrane and ER in human MSCs” for consideration at eLife. Your article has been favorably evaluated by Fiona Watt (Senior editor), a Reviewing editor, and 3 reviewers. We find the results on the independent roles of ER calcium ion release and calcium ion channels in force-induced calcium transients very interesting, and important for advancing the field of mechanobiology. While it has been known that calcium release can be triggered by external forces applied to cells, this is the first time that evidence has been presented for when one or the other mechanism is activated following the application of force. Also, the ER-specific calcium sensor used in the absence of extracellular calcium provided an elegant approach for identifying the role of ER calcium channels. We believe that this approach will be useful in future detailed studies of force-induced calcium release. 1) The IP3 is elevated in responding to the mechanic force by optical laser tweezer-mediated bead traction and so it is not responsible for Ca2+ release from ER. The authors concluded that the force was deeply penetrated to the ER to trigger Ca2+ release. This is a very interesting discovery. However, the authors should provide some clues about what kind of signals in ER that may trigger the Ca2+ release in responding to mechanic force. 2) siRNA for TRPM7 almost completely abolished the Ca2+ release (Figure 2 E and F), indicating that it may play an essential role in mechanic force-induced Ca2+ release. The authors should explain how it is coupled to the Ca2+ in ER, because both pathways contribute to the Ca2+ flux. 3) If two pathways; ER and plasma membrane, contribute to the Ca2+ flux in responding to the mechanic force, please explain why the inhibition by Gd3+, La3+, or streptomycin, blocked all the Ca2+ signal (Figure 2–figure supplement 1)? 4) The experiments demonstrate that the force transmission to the ER is an important prerequisite for ER calcium release. The finding that this effect can be blocked by inhibiting the plasma membrane channels is both intriguing and worrisome. It is hard to imagine how blocking the plasma membrane channels would affect force transmission to the ER, raising the prospect that there is some other form of signal transmission that causes plasma membrane channel activation to produce activation of the ER. If so, then this would counter all of the arguments supporting the role of direct force transmission to the ER as the primary mechanism for calcium release there. This is a point that deserves additional discussion. 5) No data are presented regarding the delay time between force application and the first ensuing calcium transient. One might expect the channels to respond as soon as force is transmitted, which should be virtually instantaneous. Alternatively, a longer delay might be indicative of a biochemical signal mediated mechanism. This also deserves discussion. We thank the reviewers for this important comment. There are two possible signals in ER that may trigger the Ca2+ release in response to mechanical force. 1) IP3R channels on the ER membrane are mechanosensitive and can be directly opened by transmitted mechanical force. Several lines of evidence supported this hypothesis. First, IP3R is coupled to cytoskeleton and associated proteins allowing mechanical coupling. A direct binding between IP3R and myosin II was discovered in C. elegans (Walker et al., 2002). In addition, IP3R has linkage to actin mediated by an adaptor 4.1N protein (Fukatsu et al., 2004; Turvey et al., 2005). IP3R also binds to ankyrins, which are adaptor proteins coupled to the spectrin-based cytoskeleton (Bourguignon et al., 1993; Joseph and Samanta, 1993). Second, IP3R channel has an α-helix bundle at the pore forming region, similar to voltage-gated potassium and calcium channels (Schug et al., 2008), which are generally found to be mechanosensitive (Morris, 2011). The mechanism for their mechanosensitivity is possibly that the α-helix tilt angle tends to change when the membrane thins upon mechanical tension, in order to do proper hydrophobic matching with the interfacial region of the membrane, which leads to channel opening (Cheng et al., 2004; Kim and Im, 2010). Therefore it is likely that the IP3R channel is also mechanosensitive. 2) Other mechanosensitive channels on ER, e.g. TRP family, may also contribute to this forced-induced Ca2+ release. A number of TRP channels have been found to express at ER membranes, such as TRPC1 (Berbey et al., 2009), TRPV1 (Gallego-Sandin et al., 2009), TRPM8 (Bidaux et al., 2007), TRPP2 (Polycystin-2) (Koulen et al., 2002). As some TRP channels have been shown to be mechanosensitive and have linkage to cytoskeleton (Barritt and Rychkov, 2005), it is likely that TRP channels located at ER may mediate, at least in part, the force-induced ER calcium release. Notably, these two possibilities are not mutually exclusive as more than one type of channels can be responsible for the force-induced ER calcium release. The discussion above has been incorporated in the manuscript (please see the third paragraph of the Results and Discussion section). Several possibilities may contribute to the observed results. 1) TRPM7 is functionally coupled to integrin, actomyocin contractility and cytoskeleton. As such, it may mediate and facilitate the force transmission to ER. Indeed, it has been shown that TRPM7 kinase can phosphorylate myosin II heavy chain (Clark et al., 2006) and regulate actomyocin contractility. 2) TRPM7 activity may have some downstream effect on IP3R in ER. For example, TRPM7 can control the protease calpain (Su et al., 2006), which can regulate IP3R degradation in ER (Diaz and Bourguignon, 2000). 3) TRPM7 may be directly coupled to IP3R in the ER through adaptor proteins. Indeed, another TRP channel, TRPC1 has been shown to directly couple to IP3R in the ER through an adaptor protein Homer (Yuan et al., 2003). The discussion above has been incorporated in the manuscript (please see the fourth paragraph of the Results and Discussion section). We performed Gd3+, La3+, and streptomycin inhibition experiments first. As they are board inhibitors for stretch-activated channels or store-operated calcium channels, we concluded that mechanosensitive channels are generally essential for the force-induced calcium release. We then conducted the TRPM7 siRNA experiment to reveal that TRPM7 as a potential mechanosensitive channel candidate is essential for the force-induced calcium release. Accordingly, this question is essentially similar to question #2: how are mechanosensitive channels at the plasma membrane coupled to ER calcium release, which has been addressed in responses to this question as shown above. In general, it is hypothesized that mechanosensitive channels at the plasma membrane can potentially mediate the force-induced calcium release at ER by modulating force transmission efficiency, mechanically altering IP3R at ER through physical coupling, as well as affecting IP3R functions at ER. It is of note that other mechanosensitive channels, including other TRP family channels besides TRPM7, may also be involved in this force transmission process. We want to thank the reviewers for the question. This question is similar to questions #2 and #3, i.e. how can membrane channels affect force transmission to the ER. Accordingly, please see our responses to these questions above. Indeed, it becomes clear that membrane channels are not isolated entities floating in the plasma membrane. Instead, they are intimately coupled to integrins, cytoskeleton, actomyocin contractility and ER membrane channels (Cantiello et al., 2007; Deng et al., 2009; Matthews et al., 2007). Therefore, these structural and physical couplings enable membrane channels to participate in direct force transmission to ER. The discussion above has been incorporated in the manuscript (please see the fourth paragraph of the Results and Discussion section). We want to thank the reviewers for this inspiring comment. We have compiled the data of delay time in each of the three groups and added the graph as Figure 4–figure supplement 1C. (Figure caption has been added.) Our data indicated that in the absence of extracellular Ca2+, the average delay time of ER calcium release monitored by both cytosolic Ca2+ biosensor and ER Ca2+ biosensor are around 100 sec. Meanwhile, the average delay time of the calcium influx through plasma membrane in the presence of 2APB and extracellular calcium is much shorter, around 20 sec, indicating faster response to mechanical force stimulation. Although the delay time of ER calcium release is longer than that of calcium influx across the plasma membrane, it does not contradict mechanical signal-mediated mechanism. Several reasons may contribute to longer time delay of ER calcium release. 1) The mechanical coupling machinery may need time for reinforcement to allow sufficient force transfer between the plasma membrane and the ER membrane. It is likely that mechanical force transmits through integrins and cytoskeleton (Perozo and Rees, 2003; Wang et al., 1993) as only Fn-coated, but not BSA-coated beads can induce ER calcium release (Figure 1C-F). However, the discrete network linkage of the existing cytoskeleton at the time of force application may not be sufficient for force focusing and transmission to ER, particularly because the apical integrins bound to the Fn-coated beads had not previously experienced force and therefore may have limited connection with cytoskeleton (Matthews et al., 2006). As force can unfold proteins, change their conformations to expose cryptic binding sites to allow the assembly of new/stronger network linkages (del Rio et al., 2009; Johnson et al., 2007), mechanical force can modulate the structural coupling of molecules and mechanical properties of the cells through cytoskeletal remodeling (Kaazempur Mofrad et al., 2005; Matthews et al., 2006; Rosenblatt et al., 2007). These modulation processes of mechanical coupling and reinforcement may need time to reach the threshold for sufficient mechanotransduction of ER calcium release; 2) the channels on ER membrane could have different kinetics and mechanosensitivity (Moe et al., 1998), therefore they may need larger focused and reinforced force to be developed at the site of ER to reach the threshold for physical opening. All these factors may contribute to the longer delay time for force-induced ER calcium release. Again we want to emphasize that our model does not rule out biochemical signal-mediated mechanisms. As a matter of fact, biochemical signal-mediated mechanisms, such as protein-protein interaction and cytoskeletal remodeling under mechanical tension are important to mediate mechanical signals as discussed above. We have also incorporated the discussion of this time delay of ER calcium release in the revised manuscript (please see the eighth paragraph of the Results and Discussion section). We would like to thank Drs. Akihiko Tanimura and Xuefeng Wang for the generous gift of IP3 reporters and valuable discussions, respectively. This work was supported by grants National Institute of Health (NIH) HL098472, HL109142, HL121365, GM106403, National Science Foundation (NSF) CBET0846429, CBET1344298, DMS1361421 (YW), and NSF 0822613, 0646550 (TJH), and NIH GM072744 (NW). © 2015, Kim et al.